Dana Stachowiak has nearly 20 years of teaching experience under her belt, but she continues to learn important lessons every time she steps into a classroom. Stachowiak joined UNCW in 2016 as an assistant professor of curriculum and instruction in the Watson College of Education. Prior to UNCW, she was an assistant professor of diversity and multicultural education at the University of Louisiana at Lafayette. She was a classroom teacher and district curriculum specialist for a decade before settling into a career in higher education. She also loves the relationships and community that form when she’s teaching. 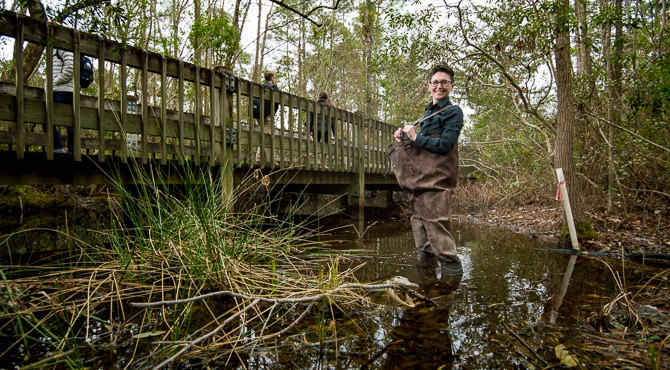 When she’s not in the classroom, Stachowiak’s second favorite place is the swamps of Louisiana, surrounded by towering Cypress trees, Spanish moss and alligators.